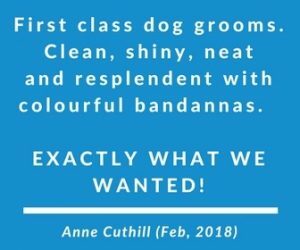 If you are a dog owner in Carnoustie, then at one point or another you’ll have found yourself looking for some type of dog services. And at least once a week, we receive a call or message asking if we can recommend a reliable dog walker in Carnoustie. Why? Well I suspect because a dog walker isn’t that easy to find, is it!?!??! I’ve been there myself and struggled with lack of websites, social media and even good old-fashioned local adverts. So, to try and make your job a little easier, I’ve pulled together a list of dog walkers in Carnoustie. Offers both group walks and day care services available throughout Dundee, Broughty Ferry and surrounding areas. While based in Dundee, they have responded to adverts in the Carnoustie area. How To Contact – via their Facebook Page HERE or their website HERE. Jackie is a professional dog walker covering the Carnoustie area. Member of the National Association of Registered Pet Sitters & Petsitters Alliance and fully insured. How to Contact – can be contacted via their Facebook page HERE. Covering Arbroath and Carnoustie, individual and group walks as well as home visits and puppy socialization. Bark Brigade regularly post on their facebook page with pictures of walks and their customers (both posts and videos). Several of our own customers use Bark Brigade and they are always come highly recommended. Fully insured and licensed dog boarders and dog walker based in Carnoustie. Mhairi and her gorgeous dogs Sherlock and Mycroft always come highly recommended. Do check out their facebook page for photographs and reviews. Coast and Country aim is to make use of the fantastic countryside, forestry and beaches we have in this area, getting your dogs out of the house and having fun. They will collect your dog from home, travel a short distance to a suitable location to exercise them before returning them and feeding/topping up water as required. When you're hiring someone to look after your furiend, you want to be prepared and understand that your dog will be safe and cared for, just like you would. Our free download covers 30 questions that will help you those initial phone calls, enquiries and meet and greets. Allison runs DoggyWalkieDooDah, a Dog Walking service in the Carnoustie, Arbroath and Dundee areas. She also provides home visits and Vet runs. Individual walks from £10 with group walks from £7.50 depending on time required. Ellen is based in Dundee but can cover Carnoustie area. Fully insured with regular updates and photos through their facebook page. Jill (and Rosie) have recently opened their fab business offering dog walks and dog boarding. Flexible and caring approach (and they love a Gather coffee too!). Katy and her furiends are regular visitors to the shop and we love meeting them all too! Katy offers dog walking as well as house sitting/pet sitting. Based in Barry, Carnoustie, Beth has completed an NC Animal Care qualification and provides dog walking and pet sitting services. Fully insured and member of Disclosure Scotland, dog walks available from £8. How to Contact – via their Facebook page HERE. Providing both dog walking and pet sitting services. While the website states both Dundee and Broughty Ferry coverage, their facebook page does state they are based in Carnoustie. Regular friendly updates on their facebook page with a fully kitted out van visible too. How to Contact – via their website HERE or their Facebook page HERE. As an experienced dog walker, Nikki offers dog walking services in the Carnoustie areas. Nikki has a great purpose built van and is also a keen Canicross runner – perfect for tiring your pooch out and she loves making use of the local countryside for those doggy adventures. Found via a google search as they have an informative website about their services (yay!). A professional dog walker with a fully kitted out van. Dog walking from £9.50 with full price list available online. Note additional mileage charge outside a certain area. How to Contact – via their Facebook page HERE and website HERE. While Gemma is based in Arbroath, she also covers Carnoustie offering pet drop-in sessions and dog walking. Dog walking services from £7-£8 per hour. A fully insured dog walker, pet sitter and equestrian hand covering Carnoustie. Prices start from £5 depending on location and whether group or individual walks but full details of services can be found on their facebook page. Based in Arbroath but able to cover Carnoustie. Available for 30 minute, 45 minute and 60 minute walks ranging from £5-£10. Fully insured and also available for pet sitting. 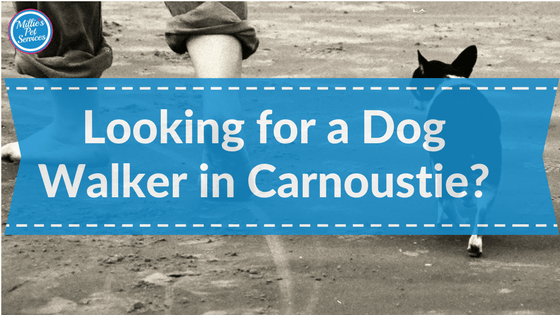 Still trying to find a Dog Walker in Carnoustie? Hopefully, you’ll find your perfect dog walker in Carnoustie in the above list. However, if I’ve missed one out, do just let me know and I’ll pop them on the list. But if you are still struggling to find someone to meet your needs, why not read our blog on Hiring a Dog Walker: How do I find a Dog Walker? It includes some tips on how you can track the perfect dog walker for your furiend. Do let us know how you get on! Hiring a Dog Walker: How do I find a Dog Walker?